Github is well-known and we are enjoying it, but now I will set up a minimal Git server on Ubuntu according to Git on the Server for some reason you have to set up your own hosting repositories, and it really works well. Get server information: Kernel and IP address. First, create a git user for your git repositories. Generate ssh keys for users, dylan for example. Your identification has been saved in id_rsa.dylan. Your public key has been saved in id_rsa.dylan.pub. Now, append the public keys into the authorized_keys file. Then, initialize a bare git repository. First, get the ssh private key from the server, id_rsa.dylan for example. $ git config --global user.name "Dylanninin Gogh"
$ git config --global user.email "[email protected]"
Compressing objects: 100% (17/17), done. Writing objects: 100% (20/20), 192.52 KiB, done. For extra precaution, you can easily restrict the ‘git’ user to only doing Git activities with a limited shell tool called git-shell that comes with Git. You may want to set up a simple web-based visualizer. 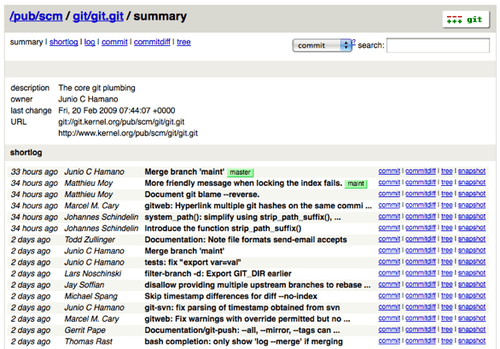 Git comes with a CGI script called GitWeb that is commonly used for this. For further details, continue reading GitWeb. You may have multiple Git accounts (always with multiple SSH keys for different accounts respectively), or the remote SSH server (Git’s most common transport protocol) is running not at the default (the well-known) 22 port, and it will work well with the minimal salvation through suffering for the elegance of design of Git and SSH. Here’s an example for a client-side setting up on Windows 7, and you may have to download a Git tool from http://www.git-scm.com/download/win, which will provide a minimal GNU/Linux environment for the Windows platform. Create the configure file to specify different account settings, host, identify file or user, etc. Without this configure, ssh will connect to the host via port 22, which will result in an “Bad file number, fatal: could not read from remote repository” error. Local Repositories: Internally supported as Git is designed for distributed development. GitLab: Project management and code hosting application powered by Ruby on Rails. GitBucket: The easily installable Github clone powered by Scala. Github: Build software better, together. Blog of dylanninin. Follow me on twitter or github. UI Designed by Twitter Bootstrap. Powered by Jekyll. Hosted by Github. Licensed under CC BY 3.0.